The Odyssey of Homer –writer of ancient Greece–, is one of the best travel stories ever told. This book, sequel to The Iliad, tells the story of Odysseus –better known as Ulysses– back home after the Trojan War. The coast of the Mediterranean Sea is the scene of this adventure that begins in the Island of Ogigia, according to the sources near Malta, where the nymph Calipso retained Odysseus for seven years. This managed to reach the imaginary Isle of Esqueria and after passing through the land of the lestrigones –giant cannibals– ended up in the arms of Circe, the sorceress who turned men into pigs. He lived with her for a year in the Island of Eea, current Mount Circeo, and then deal with the sirens of an island identified with Capri. Finally after fleeing from Scylla, the monster with six heads that lived between Sicily and Calabria, he managed to take a ship and sail to Ithaca, where he killed the suitors of his beloved Penelope and lived happily with his family. 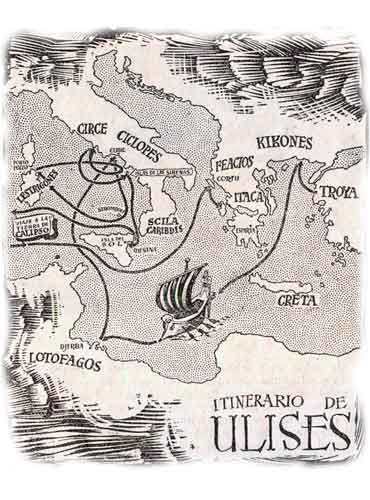 In fact, except for Ithaca, none of these places is 100% identified with specific points of the Mediterranean geography, but it is such a beautiful adventure that the romantics of history can not resist to dream of following the challenges and traps that had to overcome the Greek hero.